Decor with wall tiles is a tried-and-tested formula for areas of heavy wear or maximum exposure to water and heat. I’d usually recommend tiling an entire wall, though sometimes tiling the area next to the sink, bath or stove can look interesting if well-executed. Besides playing with scale, incorporating wall tiles provides the opportunity to add color and texture to a modern home decor. One visually arresting idea is to cover a feature wall in tiles. Though usually reserved for the floor or the bathroom, there have been tremendous developments in tile designs which make them popular with interior designers. The examples below illustrate with mixed letter tiles to textured ceramics to silk-screened Fornasetti. The bathroom (above right) is covered in grey ceramic, providing a low-maintenance, classic solution for bathrooms that incorporate baths and showers. Use colored towels and accessories to soften the space and prevent a clinical feel. The tiny grid of mosaic makes a good-looking modern surface, especially in a strong single color or in a random abstract arrangement where individual tiles of contrasting shades or gold, mirror or glass are set against the main field of color. Sheets of mosaic are available ready-made in such random designs, making installation simple. Mosaic is particularly effective in bathroom; the small scale of the grid suits the restrictions of area and the softness of the effect belies the practicalities of this hard, resistant surface. Photographs below shows interesting feature walls with floral and zebra design. The individually laid lustrous mosaic tiles on the wall in the master bedroom lend a timeless appeal to the interior (below). Mirror mosaic, also available in sheets, will make a crisp, glittery border. In the case of a home which is just one-room wide, the interior designers installed a cascade of mirror tiles along the open tread staircase. This design creates an illusion of bigger space and maximizes the light coming from the overhead skylight. For this look, you’d have to draw the exact tile dimensions on the wall and then transfer them to a paper template to cut the tiles to size. After that, fix the tiles onto the wall based on the drawn dimensions. For a more contemporary and luxurious take on mosaic, consider also covering the room entirely in metallic mosaic. 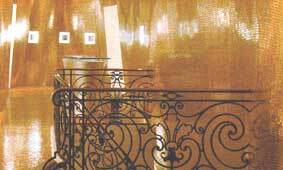 The examples below show how metallic gold mosaics are used on staircase landings and bedrooms. Reminiscent of grand hotel bathrooms between the wars, rectangular or metro wall tiles have a particularly contemporary appeal. Even more luxurious (and expensive) are luminous hand-glazed ceramic tiles that bring the charm of irregularity to what is essentially a machine-made product. If the above pictures inspire you but you're constrained by cost, consider a simplified design so only a small area needs varying hues and special hand work. Another alternative is to go for a simple mosaic work such as the colorful, swirling patterns in ceramic mosaics, popular in Mediterranean and Middle Eastern cultures. Piece together multi-colored tile shards to form a patchwork effect. You reduce the cost by using ceramic tiles instead of tiny, hand-blown glass squares. One of the current trend now is for oversized designs and elements from nature, so think close-ups of animals or plants. One possible look is to cut and piece black and cream tiles to form a swirling flower. You have a choice of either matching or contrasting grouting in the joints before sealing with varnish. This gives you an artistic mural that's also easy to maintain. How to Revamp Old Wall Tiles? If you’ve inherited wall tiles in color you hate, cover up the offending shade with paint. The tiles must be perfectly clean and dry before you begin. Then apply a base coat and two top coats of oil-based paint in the color you prefer for an instant revamp. What About Flower- and Nature-themed Tiles? Tiles with nature scenes are rather cliché for a ‘country kitchen’ style. This design went away in the 1980s. Instead, look for tiles with simple lines, graphic prints and streamlined finishes. An example would be tiles with close-up picture of a flower’s heart. Alternatively, consider stainless steel tiles with pine wood and easy-care melamine surfaces for a ‘Modern Scandinavian’ interior. Personally, I’d advice avoiding prints on tiles as they are permament and you can’t change them as your taste evolves. Instead, go bold with materials you can change easily such as fabrics and furniture. Strong simplified nature prints on upholstery and blinds will make a bigger impact than wall tiles. Take a look at wall decor ideas for more unique and contemporary wall decor tips or click on highlighted text to return to the top of wall tile.